Coming from the Gaelic bannach, bonnach or bhannag meaning ‘morsel’, Bannock Bread is a simple flatbread that originated in Scotland. However, the word panicus was not thought to have been invented until the 1500’s, so you make up your own mind. Bannock is not to be confused with Australian Damper. Bannock refers to any large round article baked or cooked from grain, whereas damper, is traditionally baked or cooked from wheat flour and water. Bannock was taken to North America and Canada by the Scottish explorers and fur traders. Flour was a highly used commodity by the Hudson’s Bay Company and also the Northwest Company. This inevitably meant that the indigenous peoples of Canada and the Northern Great Plains eventually adopted bannock into their own cuisine. Today there are an almost infinite amount of variations on this simple recipe of what is essentially flour and water. Bannock is a great source of carbohydrates, and often complimented high protein meals such as pemmican. More recently baking powder has been added to make the bread lighter and more suited to the changing palate of the modern world. Bannock can be made entirely from foraged natural resources in the wilderness, if you are lucky enough to be in the right area and have the knowledge of which seeds or roots are safe to use in the correct way. Then seasonal fruits, nuts and maple, birch and also sycamore sap, can be used instead of, or with water for binding the ingredients. 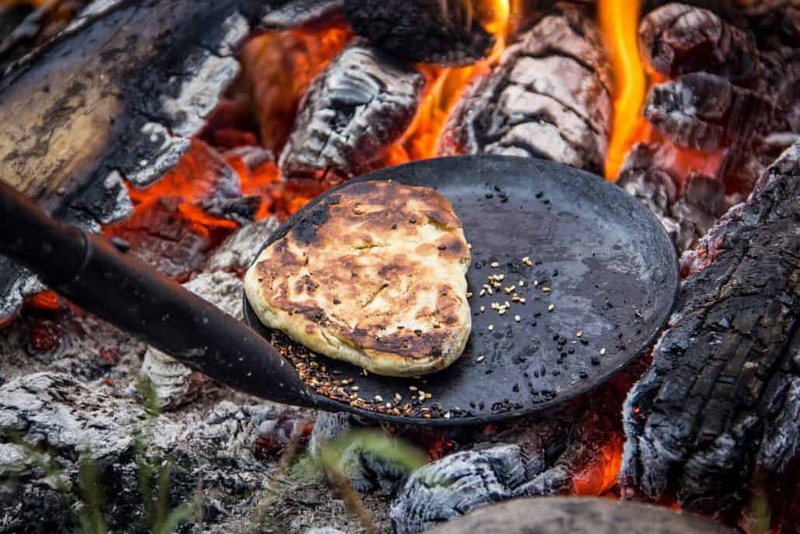 The traditional way of cooking bannock is on a clach bhannag (Gaelic) which is a D-shaped flat-topped piece of sandstone that is put next to, and angled toward the fire. The stone was also sometimes heated directly on top of the hot coals. Nowadays, bannock is more commonly associated with us bushcrafters, hikers and campers (sometimes used as a great survival food) also it’s a great food to get the kids onto campfire cooking, the next step on from marshmallows. The ease of preparation and the ability to use all manner of ingredients means that bannock is not only a simple, fun and communal food to make, but is a great source of nourishment. Bannock is as popular as ever in Canada too, even to the point where they have bannock restaurants over there, which is fantastic. Here is the recipe that I have used as a base for many years. It is slightly elaborate, but I like it. I like to add seasonal fruit or nuts etc where possible, or just lavish it with luxurious ingredients such as chocolate chips, raisins and the like. As birch tapping season is practically upon us, I am going to try making bannock with the birch sap using different reductions I think. The great thing is, you can add whatever else you like to the mix. I tend to add syrup, honey, raisins, nuts, or just about anything seasonal I can find around me. Once you have a thick dough, make your patties up to roughly about the size of a scone, or you can fill the bottom of your pot if you prefer. 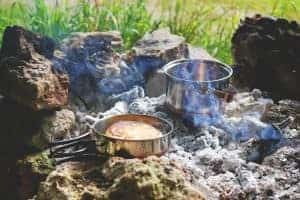 Put them in your mess tin, fry pan, pot or whatever you have available (you can even make a board from some green wood if you wanted to and put it next to the fire, tilted up using a small log etc) put the ‘pot’ on some good embers and make sure you keep turning the bannock whilst cooking. Times will vary enormously, so just keep checking for a golden brown colour and that hollow sound when you tap them. Let them cool for a while and then break them open being careful they’re not too hot still never cut them open with a knife, as this is said to bring bad luck. A variation on this recipe, although some people would argue that it is actually damper, is to twist the dough around a nice thick green stick (about the thickness of a permanent marker) and cook above the embers or near the fire until golden brown with a nice hollow sound when tapped. When cooked and cooled, remove the stick and fill the void with some nice hedgerow jam, yummy! One other way of using the ‘twists’ is as an amazing hotdog bap. Go on ….. you know you wanna try it! Our favourite way at Wildway bushcraft is to bake it then pour loads of Maple Syrup on and leave it to soak in! Anyways, hope you take away something from this article and practice your fire lighting so that you can have fun coming up with some impressive recipes of your own. Click here to learn more and book your spot.